Ms. Talley is Co-Chair of the firm's Real Estate Practice Group. Her practice includes all aspects of real estate development, financing, leasing, purchase and sales. Ms. Talley has been involved in many of the major commercial real estate developments in Louisiana. She joined Stone Pigman in 1981. Ms. Talley is a Past Chair of the American Bar Association Section of Real Property, Trust and Estate Law and is the Immediate Past Chair of the Anglo-American Real Property Institute. She is on the Board of Governors of the American College of Real Estate Lawyers. She is also President of the Louisiana State Law Institute. In addition, Ms. Talley is a founding member of New Orleans CREW. She is an active member of a number of other legal and real estate industry organizations, including the American College of Mortgage Attorneys, the Bank Counsel Committee of the Louisiana Bankers Association and the International Council of Shopping Centers. Among her civic and charitable endeavors, Ms. Talley is the past Chair of the Advisory Board for WWNO, an NPR affiliate radio station, and is a member of its Development and Marketing Committee. She is also a member of the Professional Advisory Council to the LSU Foundation, serves as the Vice Chancellor for real estate of the Episcopal Diocese of Louisiana, and is a member of the Louisiana Chapter of the International Women's Forum. 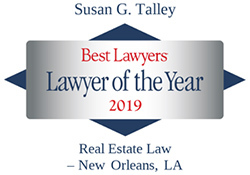 Ms. Talley has been selected by The Best Lawyers in America as the 2019, 2016 and 2014 "Lawyer of the Year" in real estate law and the 2015 "Lawyer of the Year" in banking and finance law in the New Orleans area. Who's Who Legal--The International Who's Who of Business Lawyers recognized Ms. Talley in 2013 as one of the most highly regarded individuals in real estate, an honor given to only 10 individuals worldwide per year. She was also included in Who's Who Legal: Real Estate in 2014 - 2017. She is listed in Chambers USA in the areas of real estate and banking and finance. She also has been recognized by Louisiana Super Lawyers and The Lawdragon 500 Dealmakers in America. Round Table Leader, "Developing Retail Projects on Government Owned Properties'" International Council of Shopping Centers Law Conference, October 2014. Speaker, "Shifting Times: America’s Evolving Demographics and Market Conditions," American College of Real Estate Lawyers Fall Meeting, October 2013. Speaker, "Non-Recourse Carveout Guaranties in Commercial Loans: Drafting Tips To Avoid Unintended Liabilities," American College of Real Estate Lawyers and the American Law Institute webinar, February 2013. Speaker, "Keeping It Real: Lessons in the Structuring, Handling and Teaching of Real Estate Transactions in the Wake of the Great Real Estate Recession," Association of American Law Schools 2013 Annual Meeting, January 2013. Panelist, "Commercial Lending: Lessons Learned During the Recent Economic Cycle," Louisiana Bankers Association, December 2011. Speaker, "Non-Recourse Carve Out Guaranties," American College of Real Estate Lawyers Workshop, October 2011. Speaker, "Cleaning the Closet: What Not to Wear," Presentation for Female Attorneys Mastering the Game and the Strategies that Rule, Louisiana State Bar Association, May 2011. Speaker, "Real Property: The Master Plan," New Orleans Bar Association, December 2010. Speaker, "Co-Lending and Intercreditor Agreements in This Damaged Market Environment," American Law Institute-American Bar Association eCLE Presentation, Summer 2010. Speaker, "All Systems are not Go: What Went Wrong with Co-Lending Agreements and Intercreditor Agreements in this Damaged Market Environment," American College of Real Estate Lawyers' Spring Meeting, 2010. Speaker, "Estate Planning for Real Estate Developers," American Bar Association Section of Real Property, Trust and Estate CLE Presentation, November 2009. Speaker, "Reworking Opinion Letters for the Mortgage Loan," American Law Institute-American Bar Association, Spring 2009. Co-Author, "Roundtable," Who's Who Legal: Real Estate, September 2015 and September 2014. Co-Author, "Assignments of Retail Leases in Bankruptcy," Chapter 20, and "Drafting the Lease to Maintain Landlord Control in a Shopping Center Tenant's Bankruptcy," Chapter 25 of The Sublease and Assignment Deskbook: Legal Issues, Forms, and Drafting Techniques for Commercial Lease Transfers, Second Edition, 2013. Author, "Selected Issues in Construction Lending," ALI CLE Commercial Real Estate Financing Strategies for Changing Markets and Uncertain Times, 2010. Co-Author, "Equity and Debt Financing Techniques for the Mixed Use Project," ALI CLE Commercial Real Estate Financing Strategies for Changing Markets and Uncertain Times, 2010. Co-Author, "Drafting the Lease to Maintain Landlord Control in a Shopping Center Tenant's Bankruptcy," Chapter 19 of The Sublease and Assignment Deskbook (2006). Author, "My Katrina Story," Probate & Property, Vol. 20 No. 5, September/October 2006. Author, "Assignments of Retail Leases in Bankruptcy, Part 1 - What’s Left of the Lease?" Probate & Property, Vol. 19 No.1, January/February 2005. Author, "Assignments of Retail Leases in Bankruptcy, Part II - On the Right Track?" Probate & Property, Vol. 19 No. 2, March/April 2005.